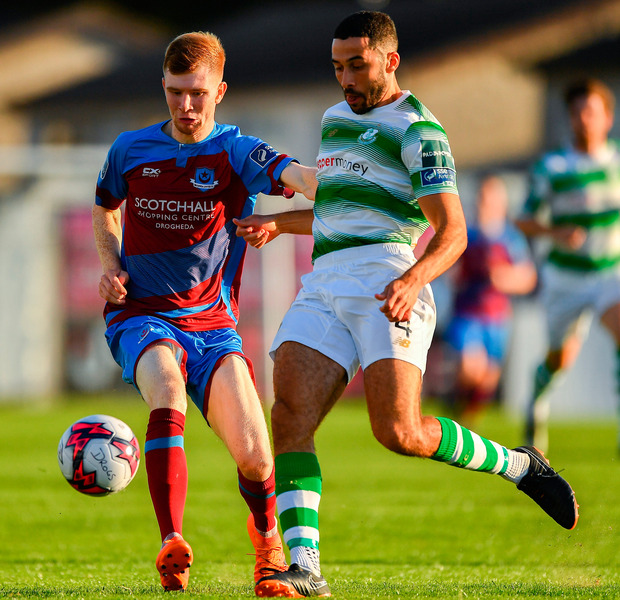 Teenager William Hondermarck was the star man as Drogheda United shocked Shamrock Rovers at United Park. The Hoops' long wait for another success in this competition will now extend into a 32nd year after Lee Grace's first-half red card left the writing on the wall. Rovers were the better side before the game's pivotal moment in the 23rd minute. Hondermarck - the 17-year-old midfielder making just his second senior start for the club - was hauled down in the area by Grace after playing a neat one-two with Chris Lyons. The Rovers defender was shown a straight red card by Paul McLaughlin - and Lyons confidently dispatched the spot kick past Alan Mannus. Dylan Watts had Rovers' best chance to level shortly afterwards but Paul Skinner made a superb save. Rovers started the second half well but failed to carve out any notable chances. The hosts were a constant threat on the break, with Conor Kane forcing a save from Mannus before Kealon Dillon was denied by the post and Mannus then foiled Lyons. 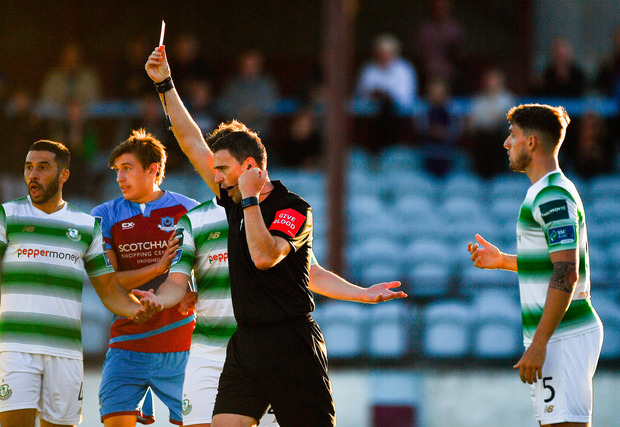 Sam Bone was Rovers' biggest threat before his withdrawal, but Drogheda saw out the match in relative comfort. DROGHEDA - Skinner; Farragher, Gallagher, Kelly; Deasy, Purdy (Dillon, 66), Hyland, Hondermarck, Kane; Doyle (Manley, 72), Lyons (Duffy, 90+4). SHAMROCK ROVERS - Mannus; O'Brien, Lopes, Grace, S Kavanagh; Bone (Miele, 68), Finn, Watts; B Kavanagh (Greene, 46), Coustrain (Armstrong, 80), Shaw. Dinny Corcoran bagged a brace last night as Bohemians throttled First Division strugglers Wexford. Kevin Devaney teed up JJ Lunney to curl a 20-yard effort beyond Colum Feeney on four minutes. Corcoran then rifled in his first from close range on nine minutes. The impressive Danny Kelly added a third on 13 minutes before veteran Keith Ward curled in a sumptuous free-kick before the break. There was no let-up in the second half as Corcoran nodded in his second on 58 minutes before substitutes Eoghan Stokes and Christian Magerusan completed the rout. WEXFORD - C Feeney; L McCartan, R Kenny, O McCormack, AJ Lehane; A Masood, D George, C Sutton, P Cahill (A Dobbs 68), D Doyle; D Walsh (S Kelly 88). 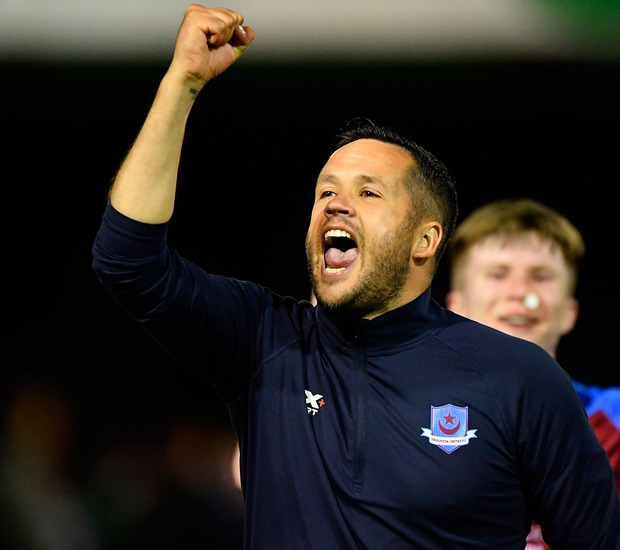 BOHEMIANS - S Supple; D Pender, D Casey, D Byrne, D Leahy (P Kirk 61); K Buckley, JJ Lunney; D Kelly, K Ward, K Devaney (E Stokes 66); D Corcoran (C Magerusan 73). 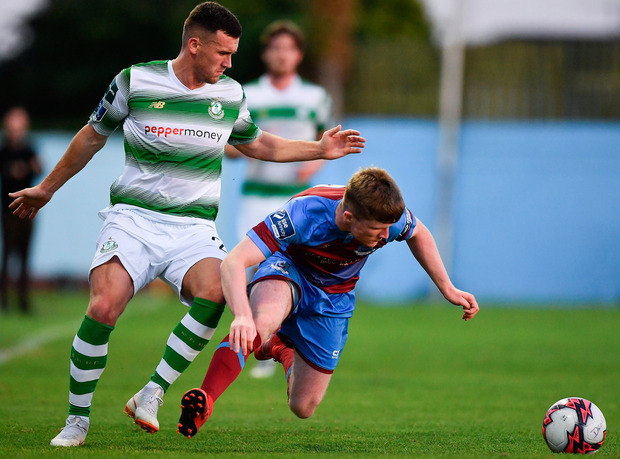 St Patrick's Athletic took advantage of Leon Fahy-Byrne's second-half red card to put five goals past the amateurs of Inchicore Athletic at Richmond Park. Jake Keegan and Conan Byrne scored twice following Darragh Markey's opener. The sides were deadlocked at the break but left-back Fahy-Byrne was sent off for a second yellow card just after the interval. The dam burst nine minutes later as Markey fired low past Reilly. Keegan made it two and the Canadian won the penalty that led to Byrne making it three. Keegan then added his second before Byrne smashed home the pick of the goals. INCHICORE ATHLETIC - P Reilly; S Plunkett, M Donohue, D Roche, L Fahy-Byrne; D Howe (K Malone 58), D Power, J Cronin (C O'Rourke 79), C Bolton, D Geraghty; S Kinch (S Fay 21). ST PATRICK'S ATHLETIC - B Clarke; S Madden, L Desmond, K Toner, I Bermingham; K Brennan, J Lennon, D Markey; R Brennan (C Clifford 62), D Clarke (J Keegan 62), I Turner (C Byrne 80). AFTER their Europa League and EA Sports Cup hopes crumbled in recent days, Dundalk steadied the ship as Cobh's hopes of repeating Monday's shock win over Stephen Kenny's charges were ended by goals from Ronan Murray and Jamie McGrath. Cobh fell behind just past the half hour when Murray tapped a Michael Duffy cross home from close-range. The hosts looked out of sorts on the ball but they gave themselves a two-goal cushion in the 52nd minute when McGrath tucked home a Dean Jarvis cross. And Murray added the third with five minutes remaining when he fired home Sean Gannon's cross. DUNDALK - Rogers; Gannon, Gartland, Cleary, Jarvis; Chvedukas, Benson (Massey 57); McGrath, Murray, Duffy (Connolly 69); Kelly (Byrne 76). 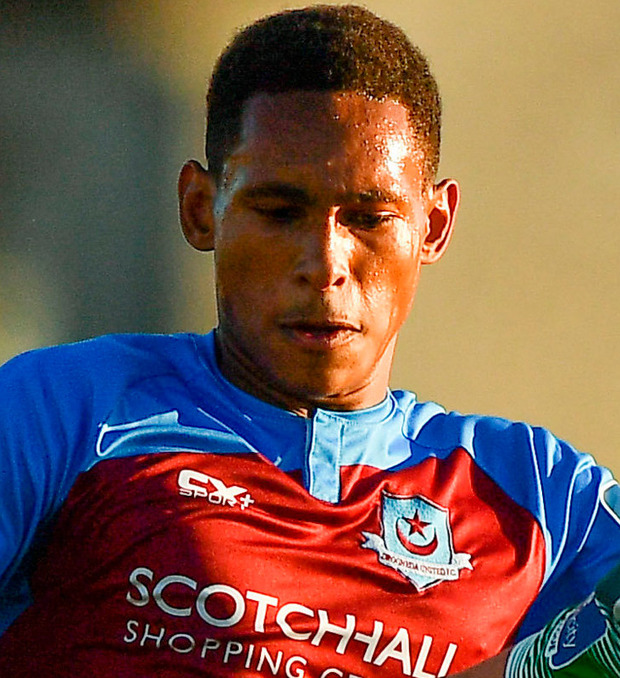 COBH RAMBLERS - A Mylod; Taylor, Walker, McSweeney, I Mylod; Fernandes, O'Connor, O'Riordan (Donnellan 74), Hurley (Leonard 61), Christopher (Kenny 67); Kabia. It was too easy for Shelbourne in this all-First Division clash at Tolka Park last night. Athlone fell 1-0 behind five minutes from the break when Nika Kalandarishvili turned the ball into his own net after Paddy Kavanagh's effort came off the unfortunate midfielder. Kavanagh doubled the lead in the 61st minute when he diverted Karl Moore's cross to the net. Shels scored their third in the 84th minute when subs Shane Farrell and Dayle Rooney combined for Greg Moorehouse to fire home. In stoppage time Lorcan Fitzgerald added a fourth after he was played in by Moore. SHELBOURNE - Delany; Collins (McEnteer 81) Prendergast, Wilson, Fitzgerald; Moore, Byrne, Kavanagh (Farrell 78), English; Moorehouse, Evans (Rooney 74). ATHLONE TOWN - Lawless; Brilly, Issaka, Ekanem, Doyle (Stokes 36); Fletcher, J Hogan, Kalandarishvili, Grogan (Hamzat 71), McCullough (K Hogan 65); Mukete. Finn Harps spoiled Gary Cronin's first game in charge of Bray with an extra-time victory at the Carlisle Grounds. Ollie Horgan's charges snatched victory with a winner through Mikey Place before Jacob Borg made sure of the result. The Seagulls failed to clear their lines three times in the 97th minute. Sam Todd helped it on and Place made no mistake. With eight minutes to go in the second period of extra-time, Borg drilled in low from 20 yards. Earlier, Wanderers were rewarded for early pressure on the quarter-hour when Gerald Pender put them ahead. But Finn Harps restored parity in the 64th minute through Sam Todd, the goal that ultimately sent the game to extra-time. Bray Wanderers - Moran; Gibbons, Kenna, Heaney, Lynch; Harding (Hayes 78), Gorman, O'Conor, Noone (Mamaliga 95); Pender, O'Gorman (Ellis 106). Finn Harps - Gallagher; Cowan, Todd, Logue; Kavanagh, Borg, Harkin (Timlin 118), Coll; Devers (Coyle 55); Boyle (Sobowale 77), Place. Goals from Timmy Molloy and Conor Davis gave UCD a far more convincing victory at the Belfield Bowl than the scoreline would suggest. Neill Farrugia shot into the side-netting early on while a header from Maxi Kouogun was saved by visiting goalkeeper Gary Neville before UCD were deservedly in front on 24 minutes lead. Midfielder Molloy was on hand to shoot home the rebound after Neville parried his initial shot. UCD continued to dominate in the second half and the pressure told on 86 minutes. Collecting a pass deep in the inside-left channel, Davis cleverly dribbled past several defenders before hooking the ball over the advancing Neville for a superb solo goal. UCD - Kearns; Tobin, Kouogun, Collins, Osam; O'Neill, Sloggett (Doyle 81), Molloy (Mahdy 71); Farrugia (McDonald 90), Davis, McClelland. Pike Rovers - Neville; W O'Donovan (Keeley 55), Lipper, E. O'Donovan, O'Malley (Hanafin 61); Rainsford, Walsh, Kavanagh, Hanrahan; McGann, Daly.